With over 50 dishes in different portion sizes, our great attention to vegetarian dishes and a kitchen that is open daily from 11:30 to 21:00: all ingredients are there for you to have a tasty experience. Our dishes are mostly prepared with sustainable ingredients and can be ordered throughout the day. Like any other qualitative Grand Café, we offer you a very wide selection of specialty beers. Next to that we serve (h)onest wines, various whiskeys, an extensive coffee menu, trendy drinks and cocktails. Do you have any dietary needs, special wishes and/or would you like to get more information about allergens? Let us know and we will take it into account and inform you! Your time at our Grand Café De Brink is special. While you are enjoying one of our delicious coffees and pastries, you are surprised by the magnificent views you have on The Brink of Dwingeloo. Do you prefer an alcoholic beverage? Please choose one from our thirteen wines by the glass with a savoury bite. Our kitchen is open daily from 11.30 with plenty of choice from the small menu. In our cosy restaurant we propose a surprising menu with various dishes. From smoked duck to a lovely French fish soup… There is something for everyone, due to the rich offer of fish, meat and vegetarian dishes. Especially or the smaller ones we have a children's menu and of course we can prepare pancakes or ‘poffertjes’ (mini pancakes)! We also have a full children's menu for the special price of € 12.50. Pleasant evening out with a special wine, beer or whiskey tasting! Grand Café De Brink is a perfect place for an informal tasting. With an extensive wine list, specialty beers in bottles and on tap and tasty whiskeys you will not miss anything. We will serve you matching savoury snacks to complete the flavours. Looking for a location for your party or event? We offer you an excellent location to organise your party or gathering. 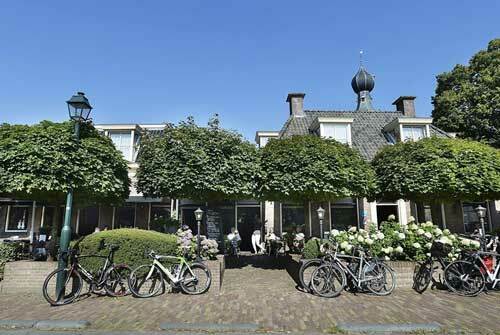 Grand Cafe De Brink and Hotel & Restaurant Wesseling together offer numerous opportunities for events, such as: family anniversaries, staff parties, meetings or other happenings. For more information on events and meetings, please click on the above headings 'Business' and 'Festivities'. Is your diet not listed here above? No problem, inform our staff and we will take care of it anyhow. We count on your understanding that we cannot give a 100% guarantee, because of contamination, but we assure you to do the utmost. All allergens information is available. Do you love to cook and do you like a challenge? Join us at our cooking studio at Grand Café De Brink! Tapas, chocolates, complete dishes: you will get a full explanation about the preparation by one of our chefs. Then we start the fun: under professional supervision you will start to work. Happy with the result? We made sure all dishes can be easily prepared at home too. Our sessions and cooking workshops consist of two drinks, the use of an apron and the recipes. The minimum number of participants is 10 people. If your group consists of 8 or 9 persons, we bill a supplement of € 5.00 per person. It does not matter if you are looking for a great evening activity or a fun break during your business meeting: we will adapt our Cooking studio offer accordingly. Interested in a cooking session with a wine package or a wine or beer tasting? Ask us for more details.